If you are a fan of political sagas (think House of Cards) and musical theatre, you will enjoy this entertaining and well executed production. 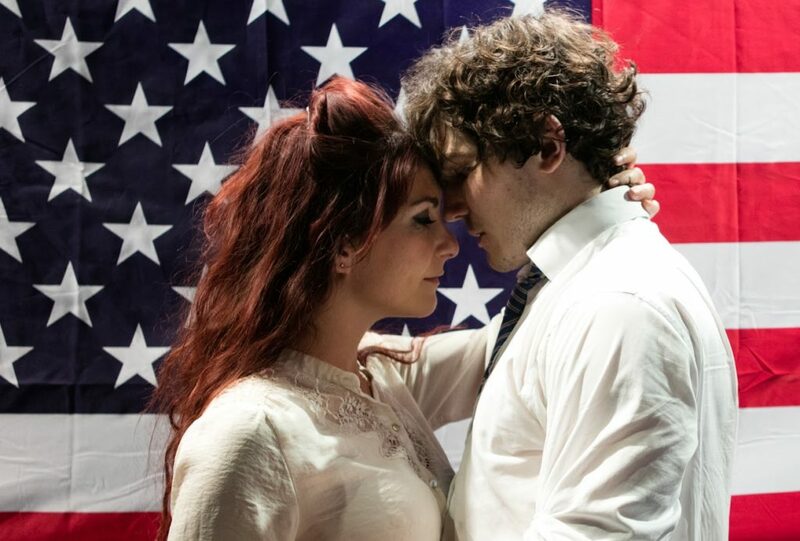 This summer sees the return of The Fix at Southwark’s New Union Theatre. Last seen at the theatre in 2012 before the Union Theatre moved into its new home (hence the change of name), the musical follows the drama and corruption of the Chandlers, a family that is determined – at all costs – to get their hands on the highest political office: that of the President of the United States. The show opens with audios playing from speeches given by the current President, Obama, and presidential candidate hopefuls. The audience is then invited to reflect on the oratory of past presidents, all of whom were marred in controversy to differing extents. 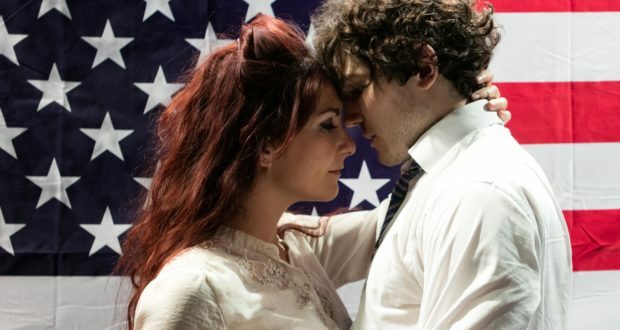 This sets up the work well, providing a historical reminder that the musical’s far-fetched narrative might not be so unbelievable a series of events: the show feels like a conglomeration of past and present political biographies. What the creative team have managed to achieve is impressive. 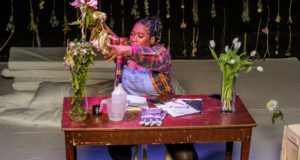 Space in the Union’s studio is limited; there is no room for grand and indulgent sets. The team have stripped everything away and use only the absolute basics: if it’s not multifunctional, it doesn’t appear. This is the most ‘naked’ I’ve seen a musical and it works wonderfully. A particular favourite is the clever use of the Stars and Stripes throughout, which helps to create some simple but highly effective images, including the coffin of the late Reed Chandler. Iain Dennis’ lighting design is visually engaging, fully supports the action and provides important moments of clarity. With so little set, the lighting is an essential and effective part of the show. Director and choreographer, Michael Strassen, does a great job at making the production work in the empty space, managing to keep the action fluid, communicative and interesting to watch. 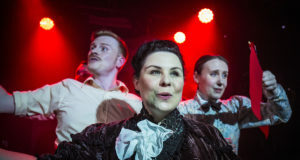 The choreography is well set, as are the performances, which keep true to the heightened style of musical theatre but appropriately hold back, meaning there were very few occasions when I thought the physicality was too big for the space. The cast and ensemble are resplendent and enduring. With competent performances all round, they visibly battle against the heat of the studio to give the show its pizzazz. Fra Fee, who plays protagonist Cal Chandler, bounces from one number and plot turn to another in a performance that is physically mastered. Some of the more engaging individual performances are seen after the interval including the vaudeville-like ‘Two Guys at Harvard’ when brothers Grahame (Ken Christiansen) and Reed Chandler (Peter Saul Blewden) play out their meeting of Violet (Lucy Williamson) in a what is a likable moment of storytelling. Other stand out numbers are offered by Christiansen in ‘First Came Mercy’ and Williamson in her rendition of ‘Spin’ – both displaying powerful and highly proficient work. As the United States approaches the race for the White House and with the controversy that surrounds Donald Trump’s Republican candidacy, The Fix couldn’t be more current. Also, the New Union Theatre is highly accessible and worth the visit. The newly refurbished bar is comfortable, smells new and feels intentionally unfinished. The studio, although small (and incredibly hot during my visit) is a nice space and epitomises the Off West End scene. All in all, an enjoyable evening and well recommended: I can’t wait to be invited back.